Wow, busy busy busy. I knew this year would be busy, but I didn’t anticipate it would be this busy! Sadly, I’m still doing just as much procrastinating as last semester. I’ve really got to fix that. But most of it is recipe browsing and blog reading, which I class as functional procrastinating (yes, even perusing gardening blogs to plan for the garden I don’t have – still functional in my book, it’s all about justifying it so you don’t feel so bad about wasting time reduced time spent planning these things in the future). However, despite being super busy, I am having so much fun!!! I love being a Thermomix consultant. My demos are enjoyable nights off from studying, but still absolutely useful – not an evening wasted. It’s a great way of combining work and play, because it just feels like play. And I’m meeting some great people along the way, which is just fantastic. I think I need to stop cooking three-part meals, though! I don’t have a lot of “no time to cook” fall-back meals, because I normally make time to cook as I really enjoy it. But in the spirit of never taking my own advice and my inherent loathing of doing what I am ‘supposed to do’ (also related to an even more passionate loathing of labels and putting people into neat little boxes)… here is a meal with multiple components. Honestly, though, they’re all pretty easy components. While I do love my thermomix for it’s amazing ability to cook dinner for me while I can read a book have a shower go for a run have a powernap watch the food channel clean and/or entertain (and/or clean) my tired little boy, I really love my thermomix for it’s ability to do one component (or two or three) of the meal while I tackle another component. I specifically love the types of meals whereby the thermomix tackles several components of a meal and all I have to do is empty it, rinse it and refill it in between components. This is one of those amazing types of meals (you do have to roll out some dough, cut it roughly, and put it in the oven – oh, the stress and the hassle!!! hehe). 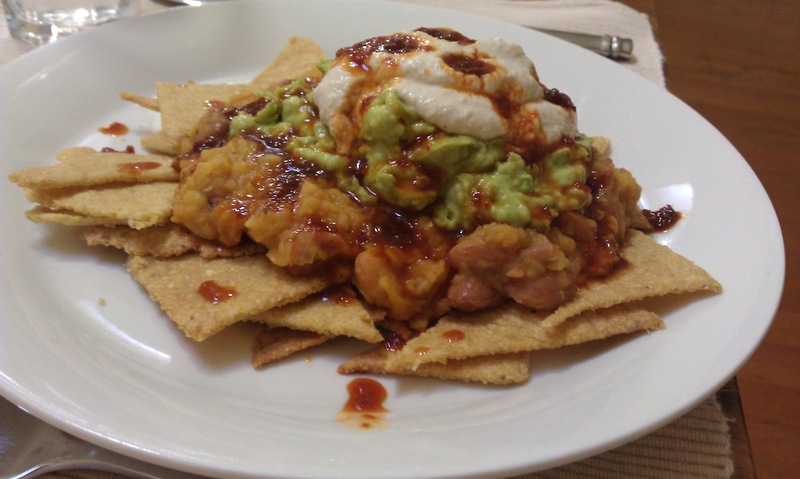 These delicious vegetarian nachos are made from scratch (of course). All except for the growing and harvesting of the ingredients, which you are more than welcome to do if you so desire (and while you’re at it, be a dear and send some of those hand-grown and hand-harvested treasures my way). Now. Let’s talk about these components. The sweet chilli sauce I pre-made ahead of time. Very much ahead of time. This is a standard pantry basic for me, and I will not let myself run out of it! That’s the only component that wasn’t made on the night of the deliciousness. 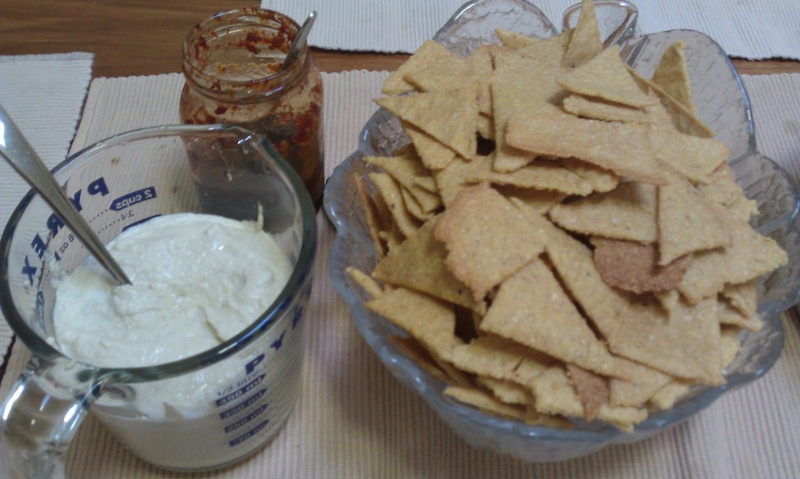 I made the dough for the corn chips first (in the thermomix of course, see recipe below), then had the thermomix get started on the rest while I rolled, cut, and baked the corn chips. I didn’t bother rinsing the TM bowl. The vegetarian chilli con carrrrrne was just based off the recipe in the EDC. I probably changed a few little things, but most importantly – I replaced the meat with the same weight of red split lentils (still using the same weight of beans as in the EDC recipe). Poured it into the thermoserver and rinsed the TM bowl (very roughly). The cashew sour cream… I just whizzed some cashews with some water and added a couple of sloshes of apple cider vinegar until it tasted and felt right. Set it aside. Then I didn’t rinse the bowl, just chucked in a couple of avocados and the juice of a lemon and whizzed them up. 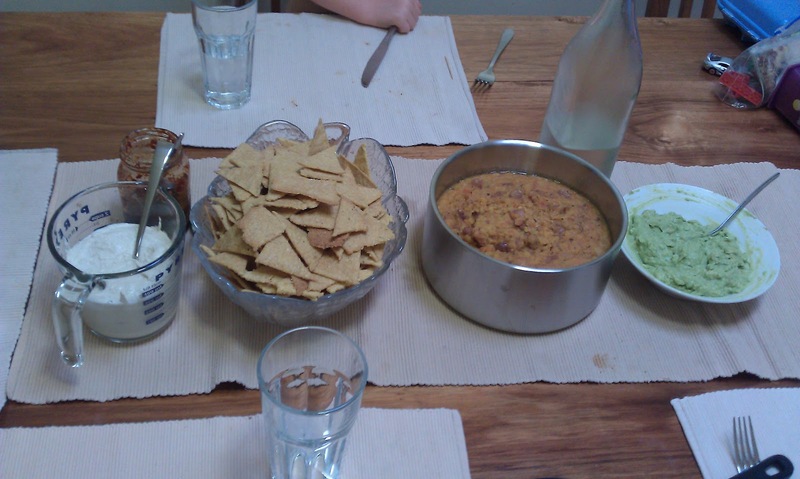 I served all the individual components on the table, so everyone could compile their own. You could add cheese too, and use real sour cream… I’m trying desperately to reduce my dairy intake. I didn’t actually miss the dairy at all in this meal, hooray! Here are the elements in all their glory! And here is a recipe for you! 2) Put all ingredients except water into TM bowl. Mix on speed 6 until well combined (about 15-20 seconds). Check and scrape down sides. 3) With blades running on speed 6, slowly pour in water until you reach a good consistency (binding together nicely, workable but a little sticky). 4) Break dough into four equal portions, and set three in the fridge while you start with the first batch. 5) Place one ball of dough on baking paper on top of a slightly damp bread mat. You will need to get the dough quite thin, and if you do it on the bread mat then try to transfer to baking paper it will all fall apart. Just do it straight on the baking paper, makes your life so much easier. By laying baking paper on top of a very slightly damp bread mat, the baking paper will be less likely to slip around while you try to roll the dough out. Sprinkling flour on top of the dough as you roll also helps; this keeps the underside of the dough stickier than the top side, and consequently it will be less likely to stick to your rolling pin and get lifted up. 6) Roll the dough out as thin as you can; about 1-2mm thick. 7) Using your TM spatula, gently cut parallel lines down the dough, about 5cm apart. Then cut more lines perpendicular to those lines to make squares. Then cut each square in half on the diagonal, to make triangles. 8) Place the baking paper straight onto a baking tray (don’t worry about trying to spread the chips apart or anything, they will cook fine). 10) Repeat with remaining balls of dough. These are great as a base for vegetarian nachos, but also fantastic to serve with dips at parties. Pop a couple into a lunchbox for an exciting little treat. I’ve heard about then thermo mix and you obviously love it.